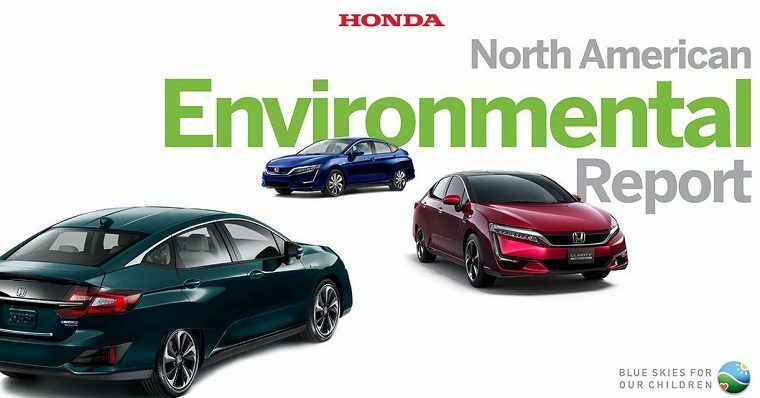 Honda has released its 13th annual North American Environmental Report (NAER), which details the environmental impact of its operations in the United States, Canada, and Mexico from April 1, 2016 to March 31, 2017. Honda made the Civic and CR-V, its two best-selling vehicles, more fuel-efficient. It also introduced the 2018 Acura MDX, which comes with a three-motor hybrid variant. Average fleet fuel economy of Honda and Acura vehicles was 4.4 mpg above the industry average, while average vehicle CO2 emissions were 11.7% below the average. Trailer deliveries and truck/rail travel were reduced by 19%, helping save 1,154 metric tons of CO2 CO2 emissions from US service parts shipments decreased 5.9%. More than 150 US Honda and Acura dealerships received a Honda Environmental Award in the company’s fiscal year 2017 for an annual reduction of 19,000 tons of CO2. Total CO2e emissions from “all North American manufacturing activities” rose 3%. That’s not ideal, but given that this was over a period of all-time record production, it could have been much worse. Per-auto waste-to-landfill from manufacturing was reduced by 93% and total landfill waste by 87% compared to 2001. Honda recycled 9,181 nickel-metal hydride batteries.